Just thought you guys would like to know. Hmm, why do those sound so familiar? Andrew Hoffmann's and Elizabeth Jacome's Are they fbtb members? work for Lego? Work for Pepsi Co.? Well, you could probably sell it back, or give it away. And why are you talking in third-person? Maybe he wants to be a Spiderman villain? Clonecommando007 doesn't think there is anything wrong with talking in third person, and he thinks that you guys should get back on topic. He also thinks that it is cool that Monsterbrick got a $200 figure for free, and also thinks that Monsterbrick should ship it to him. It would make him very happy. Gah, I am now pondering wether or not to get one on big bad eBay. Any of you guys looking to sell/trade? Hey Monsterbrick, I'll take that off your hands for a hefty..................................nothin! Well, against my better judgment, I finally broke down and bought one on eBay earlier today. I just think that since I've seen this one, the other ones look like bad imitations. Too bad I wasn't one of the Chrises that one. To tell you guys in a nice way, I think the c-3p0 thing is over rated, you could probably do the same thing with gold mettalic paint, and just restick his chest sticker on. I've collected darn near 30 sets...HUGE nerd!!!! And proud of it. However not one of them contained a 3PO. Most were 07' but I have a few late '06 sets as well. They probably won't be doing this for 2008 will they.....blast it. What's the solid price for one on eBay? I know that I haven't found the 3PO package in a lego box yet...but something in my conciense keeps telling me to research all those empty lego boxes I kept in a desperate atempt to find the 3PO package with I rightly deserved! Should I just beat myself over the head and let it go...or do a strip search on those boxes!! MY PRECIOUSSSSSS bwhahhhahha. Maybe so, but I really don't want to fool around with paint or decals. Plus even the best paint or custom will not match up to Lego quality. 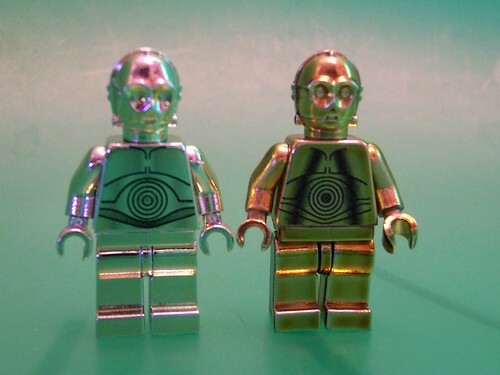 This is the best "custom" threepio I own, it is electroplated and still not up to snuff with Lego. My painted ones are even worse. That chrome one is sharp looking. Did you buy it from someone? I'm newbie.....do we talk money on this forum? And make sure you get your oxygen tank near when I do reveal $. Hmnn...what was the ending price? I think may have outbid me on one of those! You have noticed that the Minifigs don't have stickers on them, and those are printed on it, right? Well I was winning one for a while and then things went crazy and I spotted one from the same seller as a "Buy It Now", which ended up being cheaper than the auction one by quite a bit. Ahh, I was beat by $1, my bid was $90 Hopefully I win one tomorrow evening, already have my max bid put in high enough. Its already at 76. I'm soooo mad my friend got one and he wont give it to me or sell it to me. Lucky...I don't even own a republic cruiser! I'm definatly ordering one soon once my dad comes home. It was cheaper and easier for me to get one off ebay. So I did.